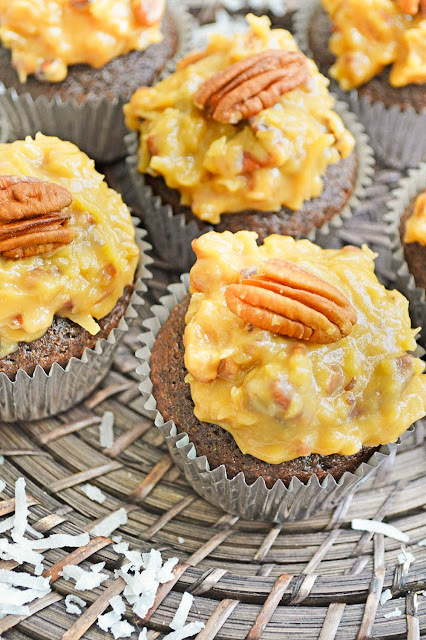 German Sweet Chocolate Cupcakes with Homemade Coconut Pecan Frosting is the quintessential cupcake for the holidays. The cupcake is made with Baker's German Sweet Chocolate Bar that gives the true German Chocolate flavor. Homemade buttery pecan coconut frosting is piled on top to complete the Iconic German Chocolate Cake that is loved throughout the holidays. For me German Sweet Chocolate anything screams Holiday flavor. 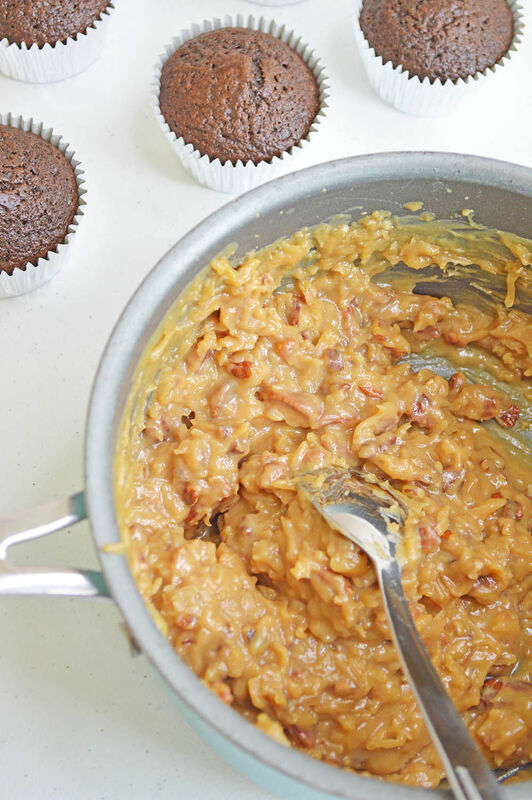 There is no substitute for the classic main ingredient in this German Sweet Chocolate Cupcakes, Baker's German Sweet Chocolate Bar. 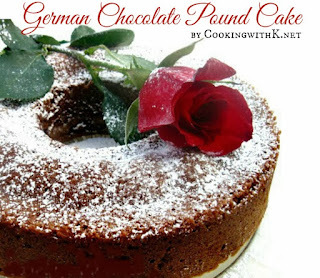 Some people use cocoa powder for the chocolate ingredient, but for me, that will not do. 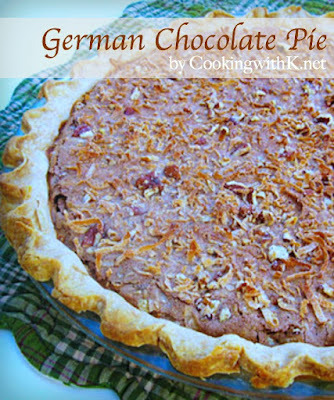 I always use the true classic flavor of German Chocolate. 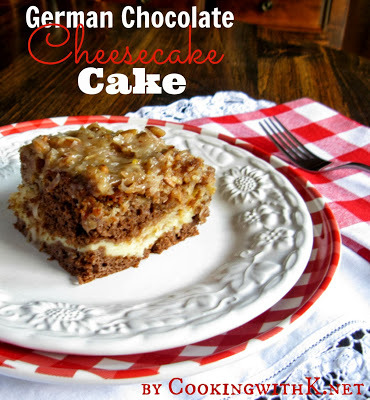 It has that distinct sweet flavor that comes from the Baker's German Sweet Chocolate Bar. Handheld mixer or a stand mixer. Make the coconut pecan frosting first by combining the evaporated milk, sugar, butter, egg yolks in a saucepan over medium heat. This will take approximately 14 minutes. Remove from the heat and stir in the coconut, pecans and vanilla; set aside and cool. Next make the cupcakes, by placing the chocolate in a bowl and pour the boiling water over it, stirring until chocolate is completely melted; set aside. Preheat the oven to 350 degrees F. Line a 24 cup muffin pan with paper liners; set aside. Next combine the flour, baking soda and salt in a bowl; set aside. Using an electric mixer with a paddle attachment, beat until light and fluffy the butter and sugar, adding the egg yolks one at a time, beating in between adding. 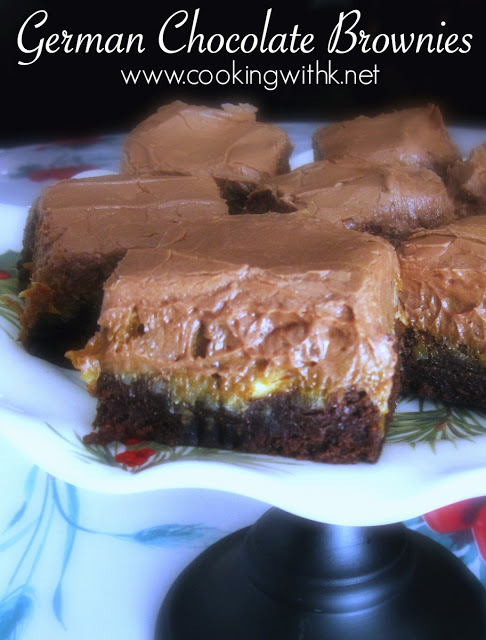 Add the melted chocolate and beat until it is fully incorporated. Add flour and buttermilk alternately, beating between adding until both are fully incorporated, but not over mixing. Using a scoop, fill the batter to two thirds up each paper liner. Place a teaspoon of coconut pecan frosting in the center of each cake batter. Bake for 25-30 minutes, or until cupcakes are firm to the touch on the outer rim of the top. Place cupcakes on a wire rack still in the pan to cool. Remove cupcakes from the pan when slightly warm. Cool for another 10 minutes. 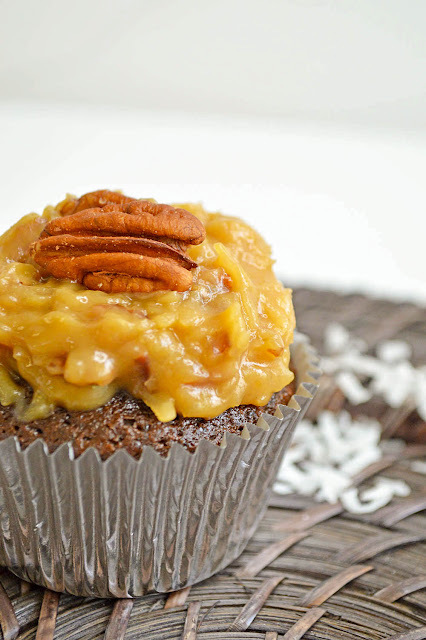 When cupcakes are completely cool, top each cupcake with a generous dollop of coconut pecan frosting. 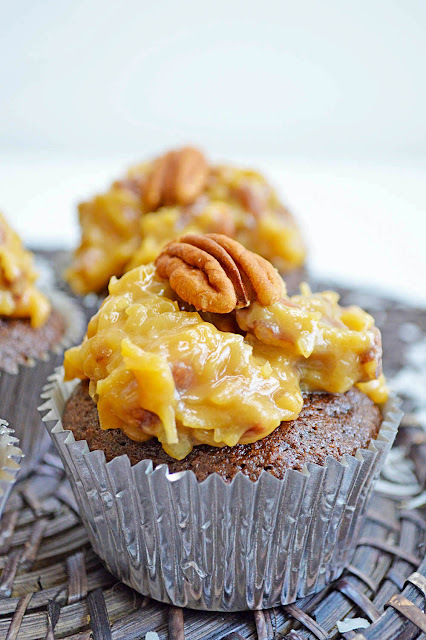 These German Sweet Chocolate Cupcakes are absolutely delicious and do not even think about not making the Homemade Coconut Pecan Frosting. It is divine. I hope you will get to make some of these cupcakes soon. Enjoy! The quintessential cupcake for the holidays. 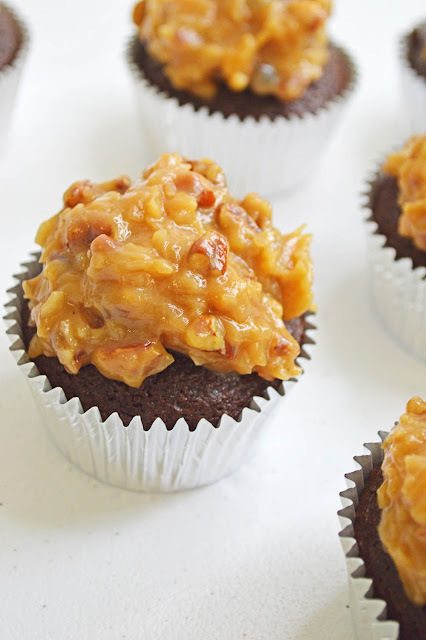 The cupcake is made with Baker's German Sweet Chocolate Bar that gives the true German Chocolate flavor. Homemade buttery pecan coconut frosting is piled on top to complete the Iconic German Chocolate Cake that is loved throughout the holidays. Make the coconut pecan frosting first by combining the evaporated milk, sugar, butter, egg yolks in a saucepan over medium heat, stirring until butter is melted. Continue cooking until the mixture is thick and golden. This will take approximately 14 minutes. Remove from the heat and stir in the coconut, pecans and vanilla; set aside and cool. Bake for 25-30 minutes, or until a toothpick inserted on the outer rim of the top comes out clean.